Liberty’s Mitchell Okuley looks to put a move on Orange’s Garrett Runyon (9) during the first half of Friday’s OCC showdown in Lewis Center. 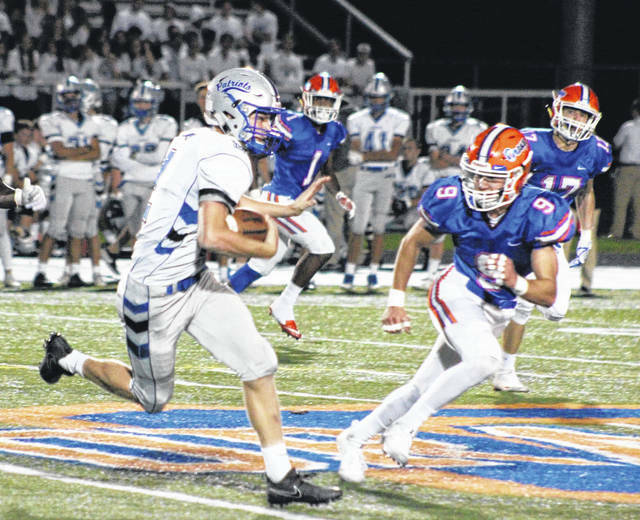 Matt Webb scored two fourth quarter touchdowns, including the game winner with 32 seconds left to help the Olentangy Liberty football team overcome an 18-point deficit in a 25-24 victory over rival Olentangy Orange Friday night in Lewis Center. The Patriots earn at least a share of the OCC-Buckeye title with the win. Liberty’s 19-point fourth quarter only adds fuel to the rivalry. The Patriots extend their win streak over Orange to seven games, which included a pair of seven-point wins last season. Liberty won a double-overtime thriller and the second came down to the wire in the first round of the playoffs. Ben Roderick caught an 8-yard touchdown with 9:25 left in the game to start the Liberty rally. Webb scored on a 1-yard run with 3:01 left to get the Patriots within striking distance. He finished with 81 yards on 21 carries and 23 yards receiving on two catches. Johnny Wiseman led with 86 yards receiving on eight catches and 29 yards on the ground for the Patriots. The Pioneers (8-1, 3-1) got it done early, taking a 17-0 lead on a Grant Simon 47-yard field goal and touchdown runs by Jack Applegate (20 yards) and Luke Schmeling (76-yards). Meanwhile, the Pioneer defense forced three-and-outs on each of Liberty’s first three possessions on the strength of five tackles-for-loss, including four sacks in the first half. The Patriots (7-2, 4-0) weren’t completely without highlights early. Troy Oehler had an interception on a ball he deflected to himself to thwart a drive in the first quarter. Liberty finally got going in the second quarter. Wiseman caught a 6-yard touchdown pass in traffic from Okuley, but a Zach Harrison blocked extra point kept it at 17-6 with 3:13 left in the half. The score remained the same at the half. Harrison caught a 39-yard touchdown pass in the third quarter to extend the lead to 24-6 with 6:26 left. Orange had several opportunities to put the game away. Liberty converted all three of its fourth down conversions and Orange went three-and-out on the possession before the go-ahead score. Bryce Houston appeared to have intercepted an Okuley pass on the second play of the winning drive, but a defensive holding penalty was called. Any one of those goes the other way and Orange has its first win over Liberty since 2011. “There were a couple of times where we were right there and something happened … adverse conditions where you didn’t get what you wanted,” Pioneers coach Zebb Schroeder said. Schmeling had 120 yards rushing on 10 carries and 107 through the air on 11-for-17 passing. Graham Starn added 65 yards on the ground on 19 rushes and Harrison had two catches for 56 yards to lead the Orange offense. Houston finished with 9.5 tackles, including two for a loss and a sack for the Pioneers, who had six as a team. Orange closes the regular season at Westerville South and Liberty wraps up at home against Westerville North. Both OCC-Buckeye contests are scheduled for Friday at 7 p.m.
https://www.delgazette.com/wp-content/uploads/sites/40/2017/10/web1_mitch.jpgLiberty’s Mitchell Okuley looks to put a move on Orange’s Garrett Runyon (9) during the first half of Friday’s OCC showdown in Lewis Center.